Ship's Store This is the ONLY official USS CONYNGHAM store on the web. 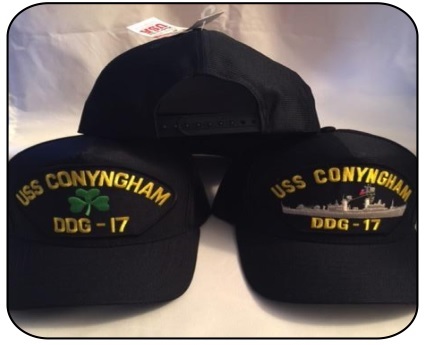 Sales from this store directly support the USS CONYNGHAM Association. This page shows items we have available in our Ship's store. Prices are subject to change. Please contact our Ship's Store Operator, Kirk Williamson (see OFFICERS page), for up-to-date pricing availability and shipping costs. The ship's store has a variety of items for sale. Most items are available at all times. This year we have a new vendor for the t-shirts, polo shirts, sweatshirts and we have added a jacket with embroidery or a ship's crest patch sewn on. All clothing items (Shirts, Sweatshirts, Jackets), in a variety of sizes, colors and logos, can be directly ordered from: https://ussc-ddg17.itemorder.com . This website will take payment and ship directly to you! If ordering a Jacket with ship's crest patch we will get one to her. There will be a $4.50 charge plus S/H for the patch to the association. It will add a few days to the order being filled. Command book on CD, Cruise books on CD, Placemats and Chief Petty Officer Insignia pins. Coffee Mugs, Key Fobs and Bumper Stickers. Plank Owner and Crew Member Challenge Coins, Ships Crest Hat/Lapel Pin and Zippo Lighter.